Visit our local parks and beaches to fully experience the beauty that is Northern California! 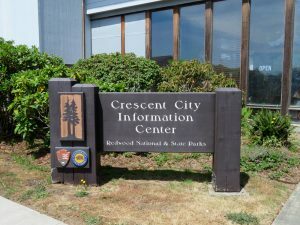 Redwood National and State Parks has 5 visitor centers to provide park orientation, information, and trip-planning advice. The parks have rangers on duty, and the visitor center bookstores offer books, maps, gifts, and more. Locations are listed below, or you can visit their website here. Information, exhibits, bookstore, live video feed from Castle Rock National Wildlife Refuge, passport stamps, restrooms, picnic area, Junior Ranger Activity Booklet. Information, exhibits, bookstore, passport stamps, restrooms, picnic area, trail heads, ranger-led activities and programs (summer only), Junior Ranger programs (summer only) and Activity Booklet. Information, back-country permits, exhibits, park film, passport stamps, restrooms, picnic area, ranger-led activities and programs (summer only), Junior Ranger programs (summer only) and Activity Booklet. Information, exhibits, passport stamps, bookstore, restrooms, pincic area, trail heads, ranger-led activities and programs (summer only), Junior Ranger programs (summer only) and Activity Booklet. Information, back-country permits, exhibits, bookstore, park film, passport stamp, restrooms, picnic area, beach access, ranger-led activities and programs (summer only), Junior Ranger Activity Booklet. Stout Grove in the Jedediah Smith Redwoods State Park. Trestle Loop Trail-head Del Norte Coast Redwoods State Park. The Corkscrew Tree in Prairie Creek Redwoods State Park, mile post marker 128.50 on Newton Drury Parkway. Riding horses in the Redwood National Park. Hollow Redwood log in Del Norte Coast Redwoods State Park. Mill Creek in the Jedediah Smith Redwoods State Park. Maps of the hiking trails in the area can be found at all of the park visitor centers and at the kiosks at the park campgrounds. For online information, check out Redwood Hikes to see all of the trails available in the Redwood National and State Parks. Below is a list of local beaches that are perfect for exploring! Whether you are walking, surfing, fishing, hunting for seashells, or watching the kids play, each beach has something to enjoy!